The golf industry has been anticipating the ruling on long putters all year and finally the announcement came that the governing bodies of golf, the USGA and The R&A, are proposing a ban on “anchoring” the putter against the body. I was not planning on writing about this announcement because I use a traditional putter and I don’t have an issue with the rule. What I found interesting and what has compelled me to write is my surprise at how well the USGA and The R&A disseminated the information! Obviously if you are a golf geek (as I am), you expected the news to unfold on the Golf Channel. Both Mike Davis, USGA Executive Director and Peter Dawson, The R&A Chief Executive were on TV. What I did not expect was the variety of materials created to communicate and explain the proposed rule change, and the fact that they are promoting a 90-day feedback period to allows stakeholders to share their opinion on the proposed change. Infographics are a great tool for visually explaining the rule. I’m a visual person so I love infographics. From a communication perspective, the use of infographics in business is becoming more common but is still not really widely used and is not considered a “standard” in the communication toolbox. Therefore, it is nice to see the forward thinking of the communications folks (at the USGA and R&A) using an infographic to support the explanation of the rule change. The other visual I did not expect was the in-depth video explaining the reason behind the decision and demonstration of the putting options. Yes, many videos are done but not all of them are done well or posted in a timely manner. The USGA and R&A had the video posted on the websites and on YouTube ready for consumption and sharing. I cannot tell you how many times I’ve seen a major company (or brand) announce a new product and not have a decent video demo posted to YouTube. And, demo videos are a standard in communication toolboxes in business today. The next thing that impressed me was the email I received from the USGA. I am a member (just a regular golfer membership for $25/annual fee) so I was not surprised to receive an email, but once again the timing of the email was impressive. It came at 8:52 a.m. (I was literally watching the golf channel listening to the live press conference at that time). Again, this simple act of sending an email early to the members is “first-class.” The email included a link to the rules explanation on the USGA website and encouraged feedback via the website feedback tool. I was not surprised at the USGA’s use of social media (Twitter and Facebook) because they have been using those channels; and the status updates on twitter and Facebook are always timely. Of course, one key to successful social media is to have great photos or images to share so the infographic and video play nicely into the social media communication channel. Finally, I think many golfers think the USGA and R&A are “old school” with a bunch of “old boys” and “old traditions.” I’m sure there are golfers that will view the decision on anchoring the putter as wrong and view the USGA and R&A leaders as hurting the game. However, based on the execution of the communication of the proposed rule change, the USGA and R&A have shown that although they are protecting the traditions of the game of golf; they are modern in their transparency and communication of their initiatives. There is no surprise that Lydia Ko won the USGA Women’s Amateur because she is the #1 ranked amateur in the world rankings (WAGR). It is amazing that she has held the number one spot for over 40 weeks (and was 14 when she attained the rank). She is another young prodigy poised for golf greatness. The USGA Women’s Amateur is a four-day event. The first two days are stroke play and the top 64 players advance to the weekend match play rounds. Lydia Ko played Janye Marie Green, an 18-year-old American, for the title. Janye Marie Green was ranked 14th in the world and moved up to the 7th ranked player after coming in second at the USGA Women’s Amateur. Janye Marie Green did challenge Lydia Ko in the finals but Ko went 3 up to win the title. The turning point in the final was late in the second round of the final day; specifically on the 24th and 25th holes. Green hit a tree on the 24th hole ending up in a horrible position. Green tried twice to hit the ball back into the fairway. She could not advance the ball and had to concede the hole. On the next hole, Green hit a beautiful shot onto the green and looked like she might win the hole because Ko was still off the green. It was amazing to watch Ko chip in and make a birdie to go 3 up. Green never got back in the match. As you can see from the tweet, 10-year-old Latanna Stone missed the cut; but so did the oldest player Brenda Picardo (who was age 56). Honestly, I was really hoping the oldest player would make the cut. Now, the USGA did not re-tweet my question (which would have been nice) but they did provide the information. 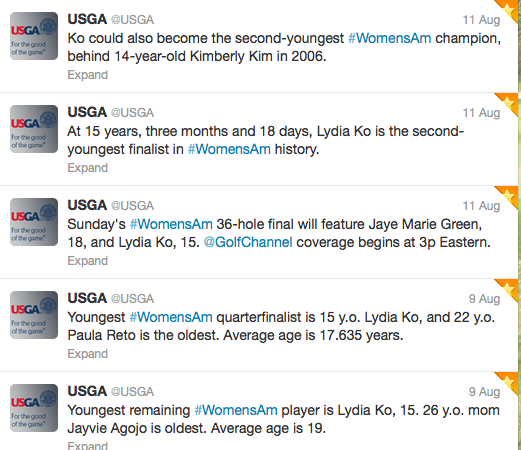 The USGA continued to tweet age information. It is interesting to see that the average age kept dropping with each round of golf. Although the tweets do not mention it, Jayvie Agojo is a 26-year-old mother with a young daughter. Agojo’s amateur world golf ranking went from 155 to 108 after the tournament. Paula Reto is a 22-year-old who did not even take up the golf until 2005. Reto was a member of Purdue’s winning team at the 2010 NCAA Division I Women’s National Championship. After the USGA Women’s Amateur tournament Reto moved from 27th to 22nd in the amateur world golf rankings WAGR. Does being a great amateur translate to being a great professional golfer? The final tweet acknowledges Kimberley Kim who won the Women’s amateur at the age of fourteen. I was curious what happened to Kim because I do not recall seeing her play in the LPGA events I watch (or course, not all players are highlighted on television). note: Kim is American and half-Korean so that is why the website soulsisters.com, a website that follows Korean players on the LPGA, lists her bio. As for Lydia Ko, all things point to an amazing future. Ko has already won a professional golf event as an amateur. In January, she made history winning the women’s New South Wales Open (Ko is from New Zealand and was born in South Korean). Ko seems well grounded, plans to remain an amateur, and then go to college. In June, 14-year-old, Andy Zhang became the youngest player to qualify and play in the US Open. This week another young golfer makes news. Latanna Stone, age 10, qualified for the US Women’s Amateur. When I heard about Andy Zhang I thought he was too young. I was curious what a few of the golf experts I follow on twitter thought of his age. I sent a tweet and got a reply from Stina Sternberg, Senior Editor, Golf Digest. Below is the twitter conversation. I was a bit surprised by Stina Sternberg’s reply. I still felt that 14 was too young. My opinion is that 18 would be a reasonable age requirement. After all, the USGA has “age limits” for other championships (e.g. junior and senior events). When I saw the news this week that a 10-year-old made the US Women’s Amateur, I said out loud (to myself) — “ridiculous.” I have no doubt the young girl is very talented but I just don’t agree with a 10-year-old competing in the event. Stina Sternberg wrote a great article about Latanna Stone. Sternberg explains Stone’s background and highlights the fact this young girl is home schooled and has a “professional website”. Sternberg suggests it is time for the “USGA to revisit its own regulations.” Sternberg goes on to state that the USGA should have them “wait until they’re at least 14 to qualify for the U.S. Amateur.” I still think 14 is too young but I’m glad to see Sternberg does feel 10-years-old is too young. I know it is common for kids today to spend a lot of time playing and practicing their chosen sport. My friends with kids spend hours traveling around on weekends to take the kids to soccer, basketball, baseball, and hockey games. But, these kids compete against other kids. I support all the AJGA (American Junior Golf Association) competitions and the USGA’s junior competitions where young golfers compete against their peers. The bottom line is that until the age limits change these kids have a right to play in the events. It’s impossible to deny the amazing talent they posses. So, congratulations to these young golfers for making it to the highest level of amateur golf. I just hope these young golfers get to be “kids” too! I think if you ask the average person who is the best female golfer of all time, many would say Annika Sorenstam. Annika turned pro in 1993 but her career took off in 1995 when she won her first US Women’s Open. In 2008, Annika retired at the age of 38 from her professional golf career with an astonishing 89 career wins, 72 LPGA tour victories, and 10 major championships. To put that in perspective; Tiger (now age 36) has 95 worldwide wins, 71 PGA tour victories, and 14 major championships. In terms of on course success, Annika is the “Tiger Woods” of women’s golf. However, unlike her male counterpart she has lived her personal life with complete integrity (no scandals for this great golfer). The tribute video below is lovely because it is a mix of her personal life (her family speaks), the impact she has had on golf, and her focus on the health of children.